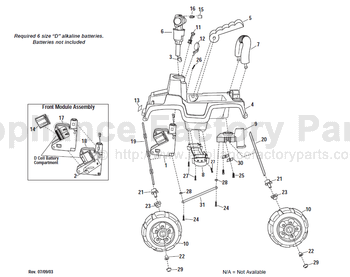 14 74240-8170 - Battery Door Assembly. 24 74240-4419 - No. 8 Trusshead Shoulder Screw. 25 0912-8012 - No. 8 X 7/8 In. Trusshead Screw. 26 0912-8005 - No. 8 X 1-1/4 In. Screw. 28 0801-0670 - Round Washer. 22 78560-2679 - Round Bushing. 1 74240-9016 - Front Module Assembly. 7 74240-2159 - Sports Bar. 8 74240-8142 - Foot Peg Assembly. 9 74240-2189 - Rear Axle Support. 15 74240-2249 - Horn Button. 16 71054-9099 - Bellows Assembly. 19 74240-4519 - Front Axle. 20 74240-4529 - Rear Axle. 30 0801-0606 - Washer Plate. 31 74240-4199 - Steering Linkage. 27 0912-8001 - #8 X 3/4 Inch Screw.